There are times when surviving the zombie apocalypse that you find yourself really missing the small things of the pre-zed days. Like watching the big game on TV. Ordering in pizza. Enjoying a cold beer with friends. And so it was that after months of hiding, skulking, life-and-death combat with voracious undead abominations, and increasingly desperate survival, the boys decided that THIS Saturday night would be like the old days. They couldn’t conjure up television, of course, or pizza delivery. They might, however, find some beer. 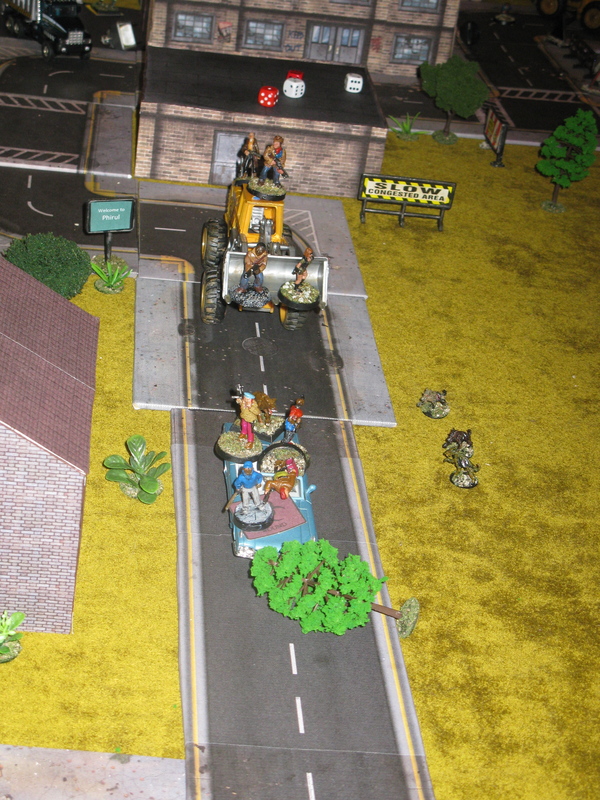 And so Coach filled up his prize baby-blue convertible “Betsy” with the last of their precious gasoline, while (bitter ex-biker) Luke, (cowboy) Tex McClintock, and (a very angry) Jackson P. Samuels loaded up with weapons and ammunition. “Everyone ready?” Coach asked as he adjusted his cap and settled his baseball bat beside the seat. “Uh huh,” replied Luke with a scowl. “Yeee hah!” shouted Tex, grinning even more than usual. 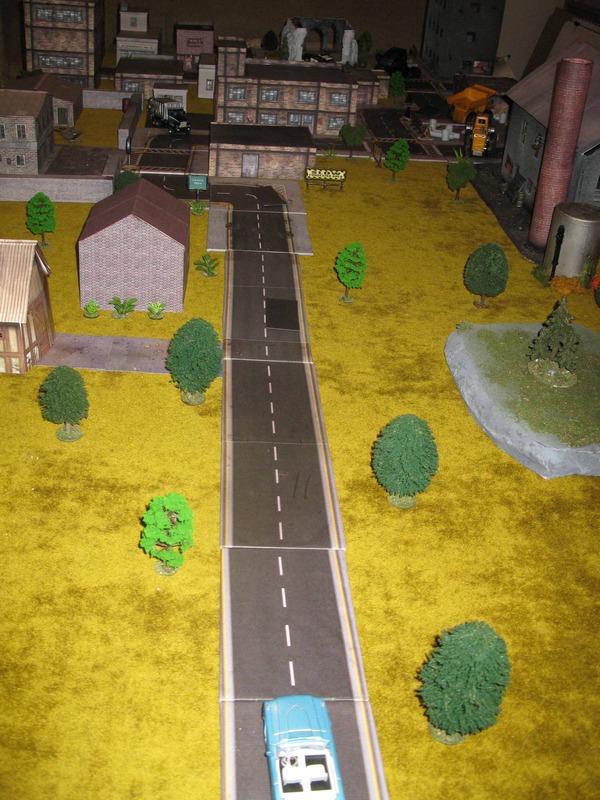 Scenario: The boys must make it to the liquor store, make a successful search there, and exit with Betsy (and any beer they’ve found) back the way they came. Coach drove along the road, keeping his eyes peeled for unexpected obstacles. The rest of the boys scanned the nearby woods, guns at the ready. 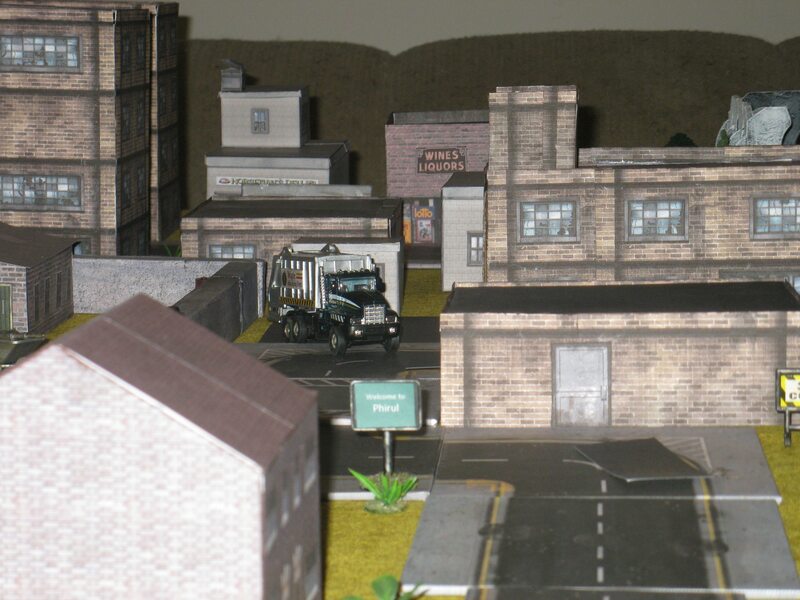 In the distance, the liquor store could be seen. 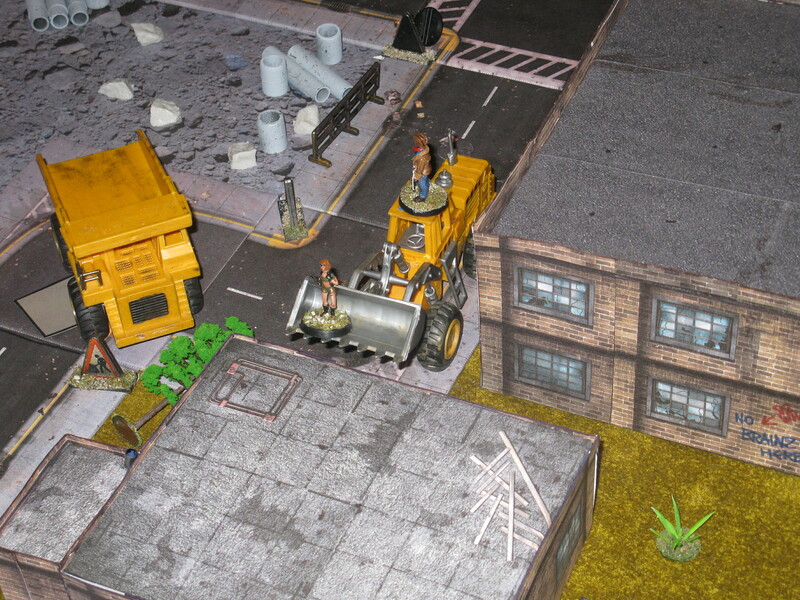 Unfortunately there was a zombie-infested town between them at it. After a few minutes they encountered a tree than had fallen in the road, possibly from last month’s storm. They managed to get past it without damaging the car. “There, that looks good” said Luke, as he pointed to a walled enclosure in an area of warehouses. 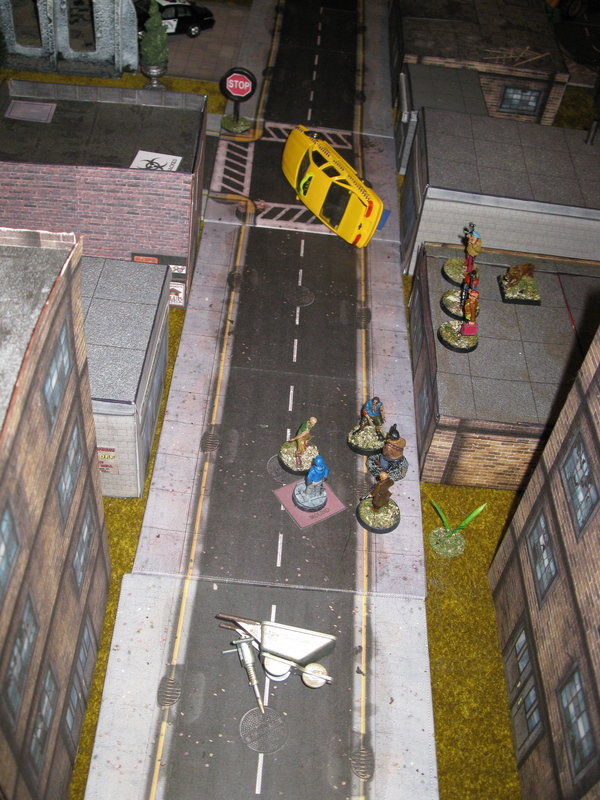 They doubted they could get the convertible all the way downtown, and they certainly didn’t want the engine noise attracting a lot of zombies in the vicinity of the liquor store. Instead they would park Betsy somewhere safe and traverse the rest quietly on foot. 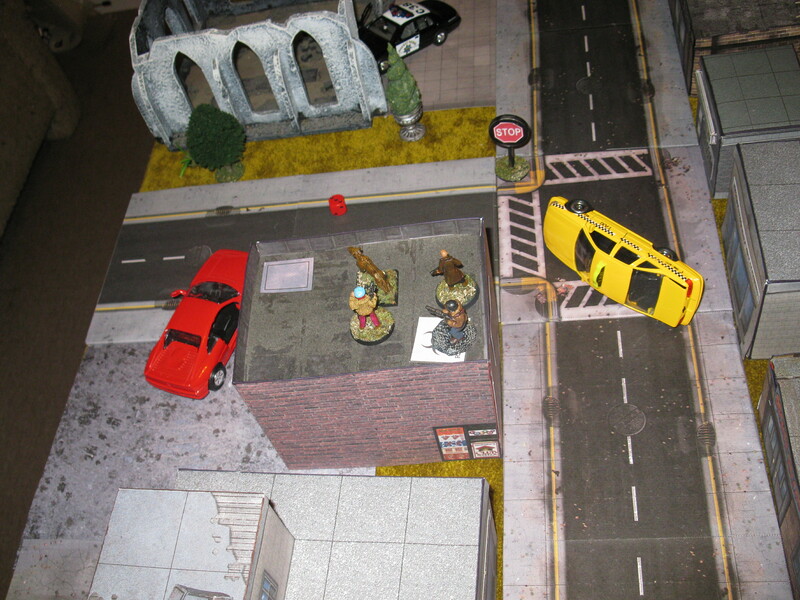 A lone zombie, attracted by the commotion, headed towards the area where they parked. 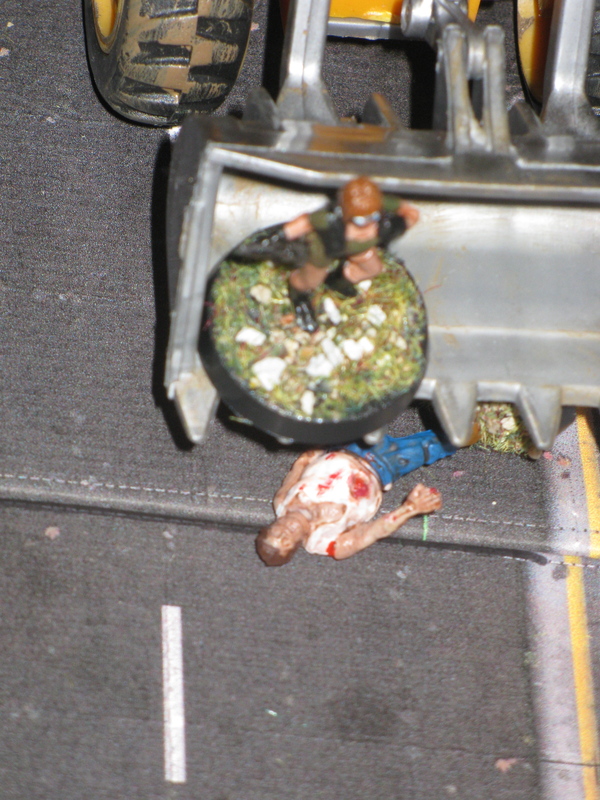 Tex and coach went to terminate the zombie, while Luke checked one of the warehouses. Jackson stayed with the car, but soon his attention was drawn to the sight and sound of four figures scaling a nearby wall and heading towards him. 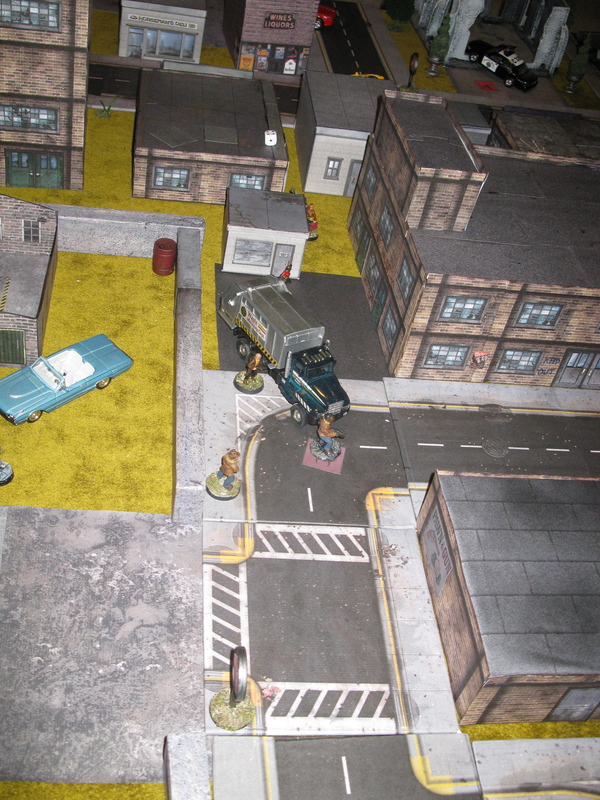 He was about to shoot when he realized that they weren’t zombies at all, but more survivors. “Well, what are four lovely ladies like you doing in a m&^^%ther-f&^king place like this?” he grinned. The girls giggled. Jackson turned on the charm—these were mighty fine ladies, and heavily armed ones too. To his horror, they suddenly drew their weapon and aimed in his direction. 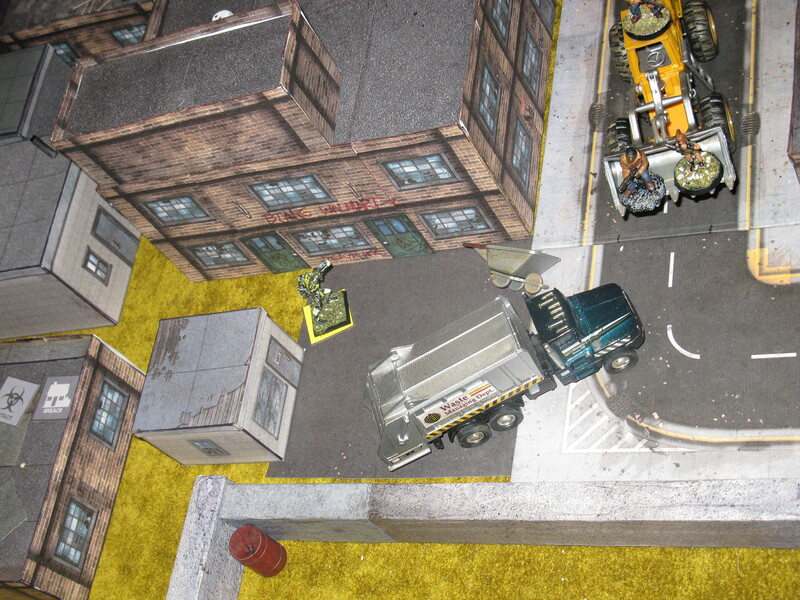 The staccato burst of assault rifle fire, the blast of a shotgun, and several bursts of submachine june fire rang out—and two zeds fell to the ground from atop the concrete wall to his right. A third reached Jackson and bit him before one of the girls capped it in the head. 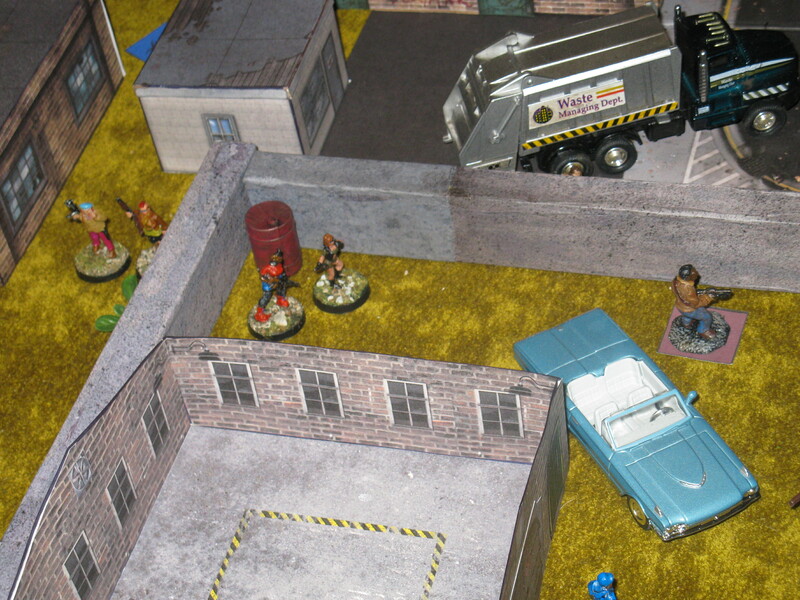 “I’m Fifi,” said the redhead in the blue beret as she reloaded her SMG. She introduced her three friends: Polly Butyl, a shotgun-wielding ex-performance artist; Imani, a Kenyan exchange student with an AK47; and Jane Doe, who apparently didn’t want to talk about her past. After further discussion they decided to join forces. The conversation was cut short by a ringing sound somewhere nearby. “There it is again!” shouted Polly, who vaulted over the wall. Fifi followed her. Discarded in the grass behind a music store lay a satellite phone. And it was ringing. Polly picked the phone up, but missed the call. Fifi, in the meantime, had found something else: a large collie dog, apparently also attracted by the sound of the phone. She quickly befriended it. With the group having grown to eight (or nine, if you counted the dog) it was clear that they wouldn’t all fit in Betsy for the ride out of town. Luke checked out a nearby dump truck—it seemed in good condition and had some gas in the tank, but they keys couldn’t be found anywhere. 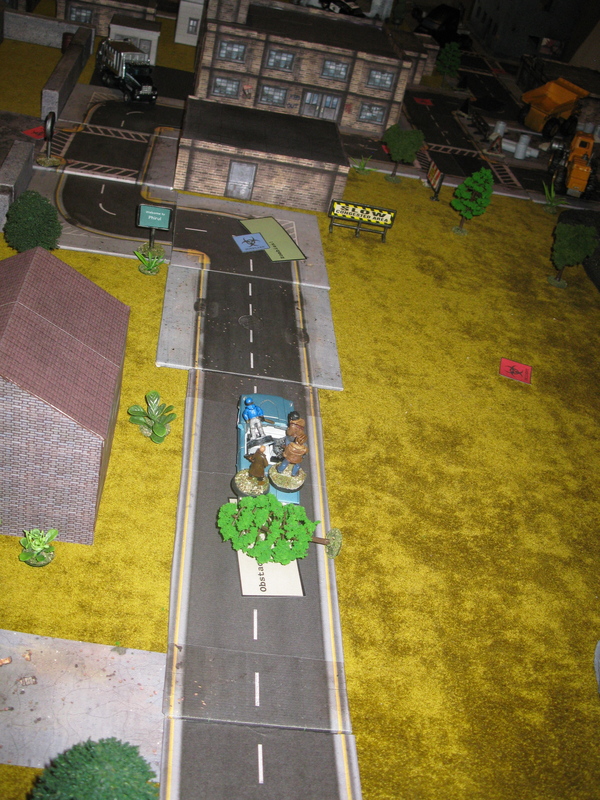 Several zombies shambled towards them along the road. They didn’t get far: a small pack of feral dogs had started hunting there, and picked off the shufflers one by one. 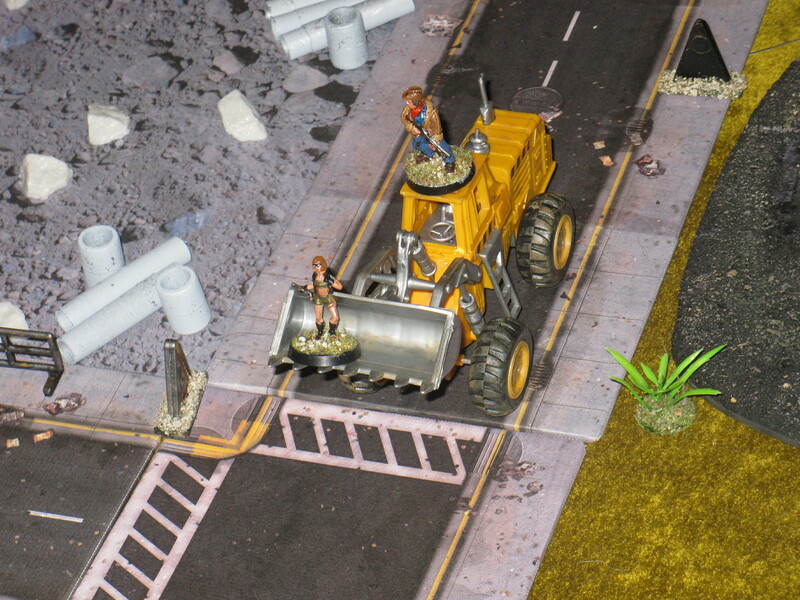 Tex and Jane ventured further down the street, where a front-end loader stood blocking the road. That worked! Tex climbed into the driver’s seat, while Jane took up position in the large metal bucket. Luke forced open a rear window into the music store, and they all climbed in. Jackson had his wound patched up. 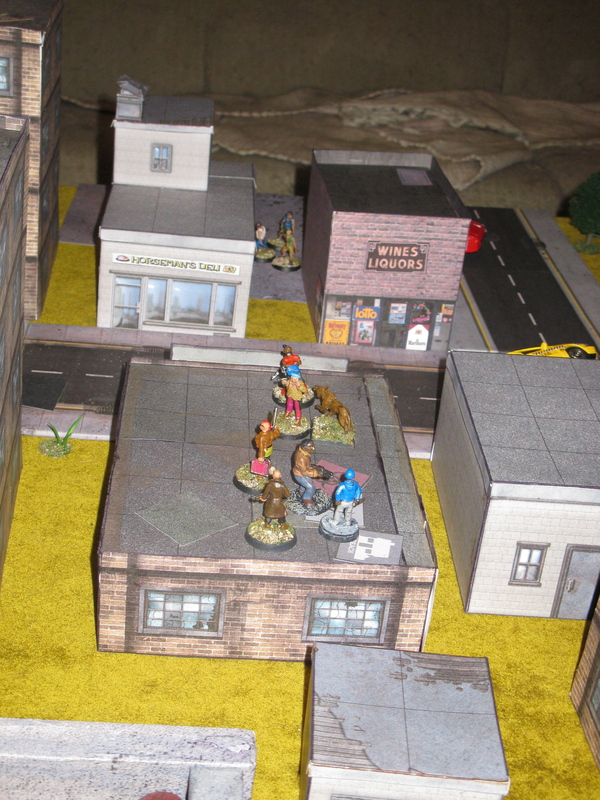 Several zombies could be seen milling around the liquor store. 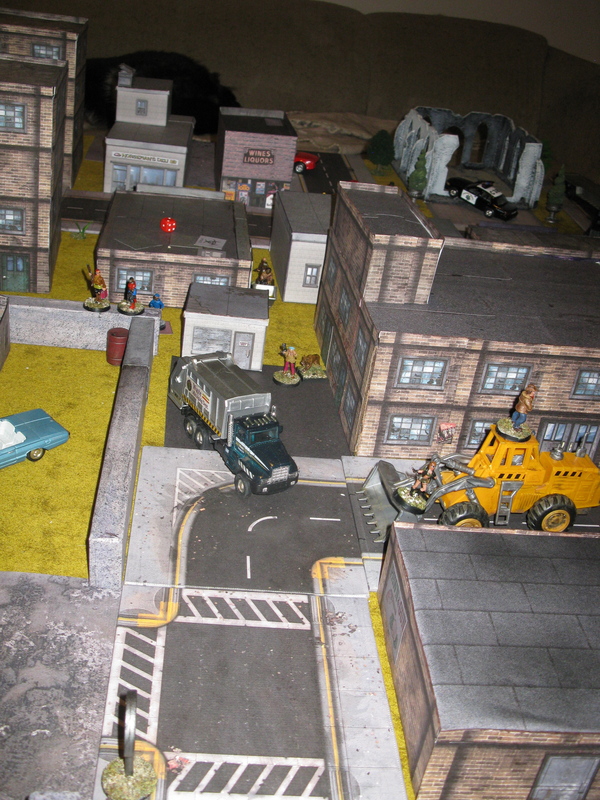 Meanwhile, Tex and Jane went on a murderous rampage with the front-end loader, crushing the zombies attracted to the noise of its powerful engines—and leading many of them away from the liquor store. Those that didn’t expire right away were finished off by Jane with a blast from her sawn-off shotgun. 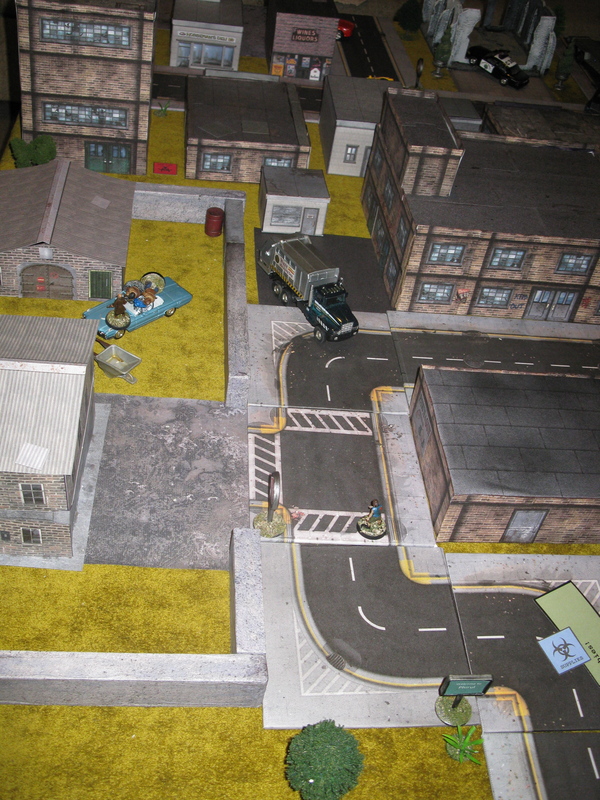 Jackson, Luke, and Coach headed out into the street to finish off the zombies around the liquor store, while the girls provided covering fire. They made short work of the undead, although unfortunately Coach was bitten once in the process. 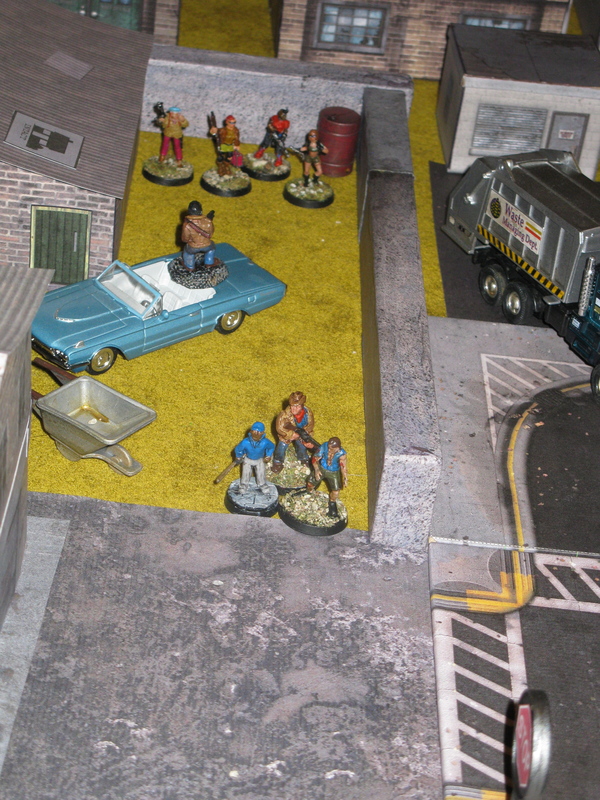 Jackson, Luke, and Polly then pushed their way into the abandoned building. It was badly smashed up inside, but Polly discovered a locked refrigerator. Prying it open they found a half dozen cases of warm beer. Success! Now to get it all out of town without being eaten. 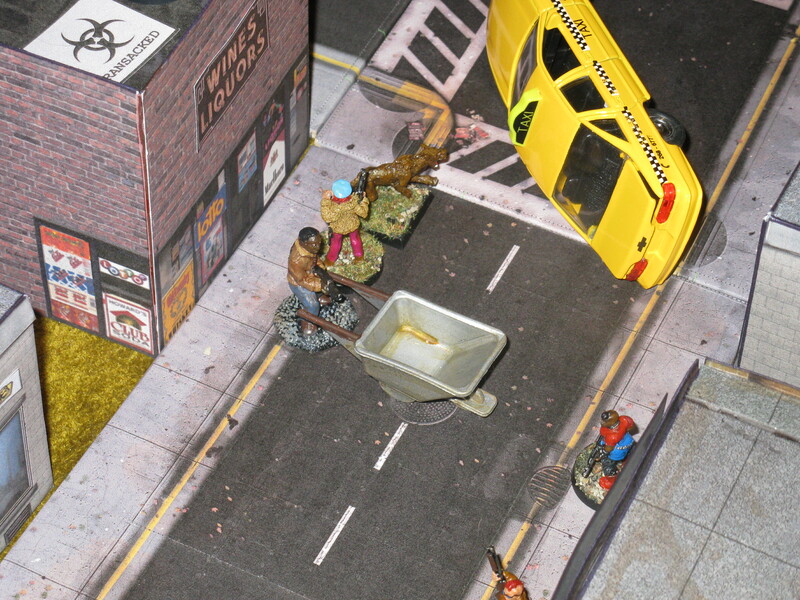 Coach noticed an abandoned wheelbarrow in the street, which they soon loaded up. Jackson started to push their prize back towards the convertible, while the rest of them stood watch. Everyone headed back to meet up near the warehouses. Jackson took a little longer with the wheelbarrow—there was no point smashing up the beer after all the work it had taken to find it. Fortunately, the foul creature wasn’t fast enough. The boys quickly drove out of town with the beer and the girls as the small pack of feral dogs barked encouragement. Neither Jackson nor Coach showed any ill effects from their earlier bites, and hadn’t been infected. Even during the apocalypse, life still has its sweet moments. What a great work of art that you made it there , I just wish that I was your neighbor so I could get some of that fun , dont you wanna move to Ma?? Lmao …great job , Amazing!!! !